While we were teaching a seminar in Ghana, we met a group of UN representatives staying in Accra, Ghana, for a UN African conference. 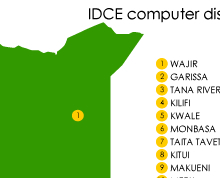 One representative from Kenya came to see the seminar and passionately requested us to bring IDCE to Kenya. 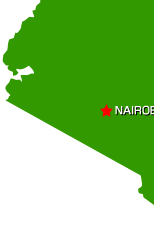 He made the arrangement with the Kenya Ministry of Research, Technical Training and Technology as well as the Kenya Industrial Research and Development Institute (KIRDI). 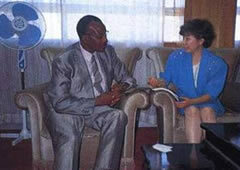 The request became official when the Ambassador of Kenya to Japan contacted us. 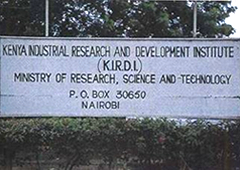 KIRDI became the IDCE on-site operating organization and applied for a grant. 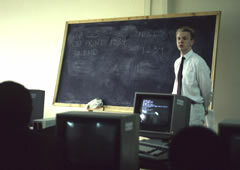 In 1992, we donated 200 sets of computers. 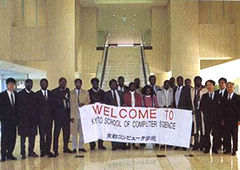 In January 1993, we offered the first IDCE/Kenya seminar at KIRDI in Nairobi with 3 IDCE/KCG instructors along with 3 MIT graduate-student volunteers. 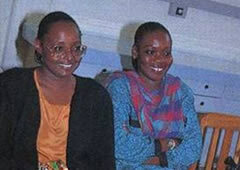 One of them was Denis Ouma Okumu, who was a native of Kenya. 30 teacher-students took the seminar. 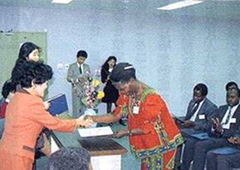 In Feb., 1993, with the grant from the Japan Expo Commemoration Fund Project, we invited 16 selected Kenyan teacher-students to KCG, Japan for a more advanced seminar. "...Such an approach would help us to avoid the long standing inequality that has existed between rural and urban institutions." 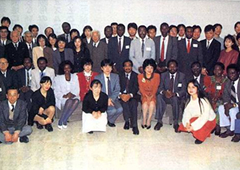 In March, 1995, we presented our IDCE project at the conference by the Comparative & International Education Society, held in Boston, Massachusetts. One of the audience of our two-hour presentation was Dr. Hillel from Doshisha International High School in Kyoto, Japan. 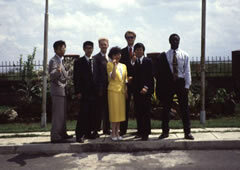 This encounter triggered the collaboration with Doshisha International High School. 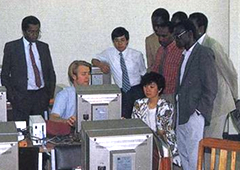 In 1998, as a collaboration between IDCE and Doshisha, we donated 140 "Windows" desktop computers and portable notebook computers to the Ministry of Education in Kenya. These computers were distributed to 9 schools. Later we were informed, "Out of the teacher-students were born an IT leader in the Kenyan government and IT specialists. " 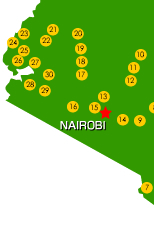 December IDCE instructors arrive in Nairobi. The first seminar in Nirobi held for teachers of the receiving schools. The second seminar held at KCG, Japan. 16 people from the first seminar participants were selected and invited. 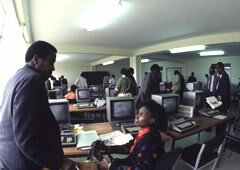 The donated computers distributed throughout Kenya. 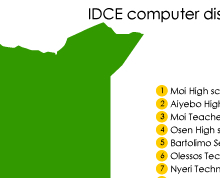 First computer education starts at 61 schools. December Receive appreciation from permanent secretary of Ministry of Research, Training & Technology. November 140 computers donated and distributed to 9 schools in Kenya, a Joint project with Doshisha international Junior /High school.